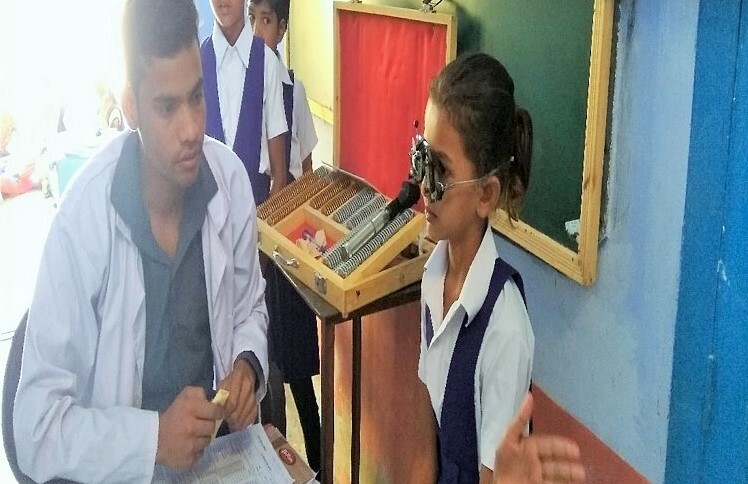 In an effort to extend our efforts in boosting learning outcomes for children in rural areas, we have initiated a pilot project along with VisionSpring to identify students having trouble with vision and facilitate them with the necessary eyeglasses. Our Team Balika (Educate Girls’ community volunteers) were first trained on vision screening by experts from Vision Spring. The training then followed with screening of school children by Team Balika, who conducted this screening using the vision testing kit. The list of identified school children was then shared with the Vision Spring team who conduct a final screening of students and provide eye glasses and other health tips for maintaining healthy vision essential to concentrate and do well in studies. The training of Team Balika was conducted in April 2017, followed by screening and identification of children facing problems with vision for the pilot phase. The team from Vision Spring then conducted a final eye testing camp and issued glasses to students who required it in May 2017. The pilot was conducted in some blocks of Bhilwara, Bundi and Sirohi districts of Rajasthan. Of close to a 1000 students screened, 25% were identified with eye problems. 14% of these children were under the age of 15. The pilot will continue until April 2018 and will then be measured for effectiveness. In the realm of improving learning outcomes of children, there is a lot that needs to be done. This initiative is a small step towards adding another measure to improve the quality of education for children in India. Dandona R, Dandona L, Srinivas M, Sahare P, Narsaiah S, Muñoz SR, et al. Refractive error in children in a rural population in India. Invest Ophthalmol Vis Sci. 2002;43:615–22.